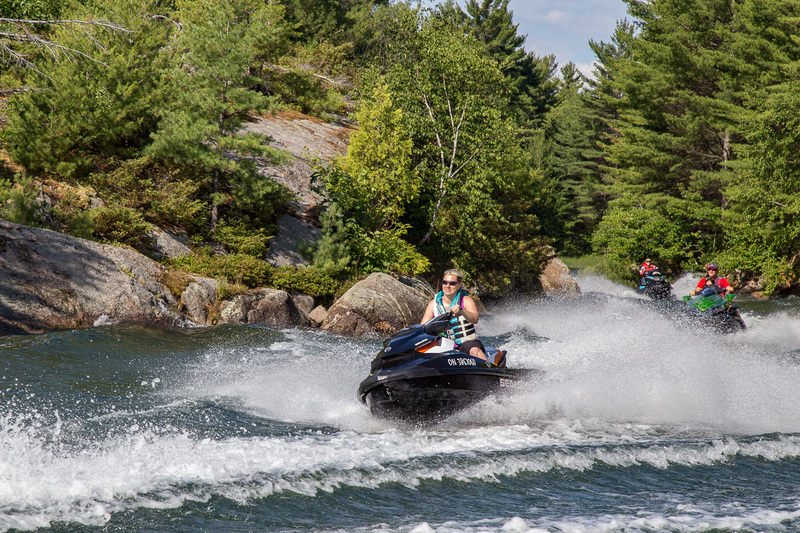 These days, keeping cameras dry on Sea Doo tours is more of a concern because so many riders carry them. Most riders take photos using their smart phones. While these are handy and easy to store, I’ve found that their size and shape requires extra care while handling over the water. In part, that’s because taking one-handed photos can be difficult. And I’ve found that shooting one handed is my surest way of not only getting good PWC action photos, but also keeping cameras dry. When my smart phone is not in use, I use a Seal neck pouch that hangs inside my PFD for keeping cameras dry. When sealed, this waterproof pouch keeps out the wet. Meanwhile, my PFD both cushions it and keeps it from flopping around while jetski riding. The neck pouch also avoids having to put the smart phone in a storage bin. There, it might get wet, banged around or damaged by other gear. Or dropped during transfer from one place to another. 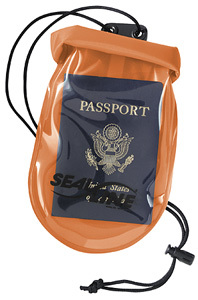 Carrying it in my neck pouch also means I don’t forget to take it with me when I go ashore. And don’t forget it on the restaurant table! But now I have a good alternative to my neck pouch. Sea Doo has upped the keeping cameras dry game thanks to the new platform design for 2018 on many of their watercraft. 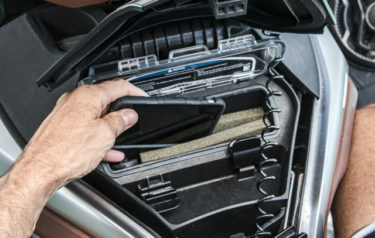 The Sea Doo glove box storage compartment now includes a watertight slot for my smart phone. Not only is it secure and cushioned, it’s also conveniently located between my body and the handlebars. And best of all, I can plug my phone in while riding to keep it charged. However, wherever you keep your phone, there’s a primary danger zone for getting it wet or dropping it overboard. That’s when you take it out to shoot photos. So I’ve jerry-rigged a more secure way by attaching an Aryca Floating Lanyard to my smart phone case using a small metal ring. You can achieve the same security with a regular tether over your wrist. But this will sacrifice the back up provided by floater capability. As soon as I take my smart phone out to take photos, I slip this foam floater lanyard over my wrist. That way, if the phone does inadvertently slip from my grasp, this safety ring prevents it from going anywhere. And if it does go overboard, that bright yellow lanyard may allow me to rescue it before any serious water damage occurs. I’ve always shot many of my best PWC action photos with a water resistant SLR camera. I selected one that’s easy to hold in one hand while shooting on the fly. And its zoom function is better and easier to work with one hand than a smart phone. It also shoots burst and has good image stabilization that enables me to take better photos. I also selected my SLR camera size to fit in my chest pouch. This harness has a waterproof zippered compartment that sits on my chest outside of my PFD. Sturdy plastic snaps secure it in place around my body. Fair warning: Unless you’re luckier than me, any pouch you find that could work may need some personal modification. For example, mine isn’t waterproof. But it is heavy duty enough that most splashes won’t penetrate easily. To be extra certain, I’ve lined it with plastic and fabricated a plastic hood over the zipper opening. I found my chest pouch at MEC, but they may be hard to come by. Be sure to check out both the hiking and paddling departments. Also try a good camera store. Or maybe even where you buy fly-fishing gear. Good alternatives for keeping your camera from getting wet when not in use are a waist pouch with a large compartment. Or even a small backpack that can be worn in front. 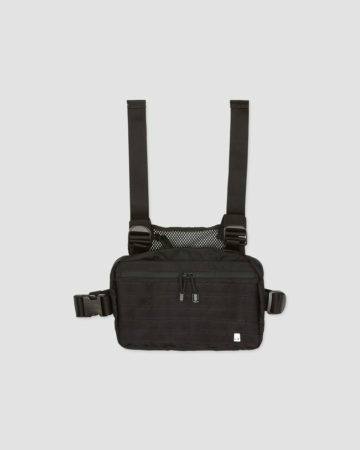 You may also be able to adapt a sling bag or shoulder strap case. 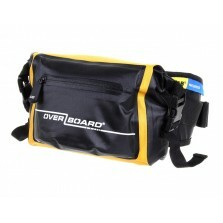 Check out the selection at Overboard or a Seal Hip Pack. A last resort option is a dry bag. No doubt it will keep your camera dry when not in use. But it’s nowhere near as handy as a pouch that’s attached to your body for quicker access. A pouch also makes it easier to get at your camera with both hands, thereby reducing the odds of dropping it. When not in use, I slip my SLR camera inside the chest pouch to keep it protected and dry. For use, the first thing I do after opening the pouch zipper is to place the camera strap over my head and around my neck so it’s not going anywhere if I drop it. When I’m not intending to shoot for a while, I take off the chest pouch and pack it securely in the front storage compartment of my Sea Doo watercraft. One key factor in keeping any camera dry is being hyper aware of your surroundings when it’s time to shoot. I don’t shoot if the waves are too big. I keep a sharp eye out to avoid the wakes from larger boats. I let my riding companions know that I’m shooting, so be careful not to spray me. I position myself where I’m least likely to get wet – this is where a good zoom helps me maintain a safe distance. If I see a splash coming, I turn away, hold the camera high above my head or protect it with my arm. 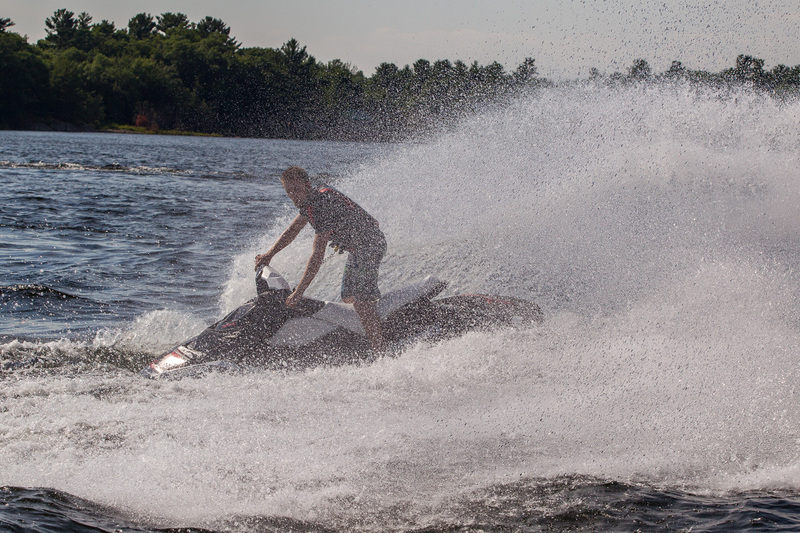 And if there’s a Waverunner in the group, I’m really careful to avoid its signature rooster tail! Despite all of this care and caution, my camera occasionally gets splashed. So I carry a soft dry cloth to wipe off any moisture immediately and usually that’s enough. The one time it wasn’t, I hand dried it thoroughly and then stopped using it for the day so it could air dry in my waterproof storage compartment. Fortunately, that did the trick. There’s no foolproof way of keeping cameras dry on Sea Doo tours. But a little planning, preparation and extra care on the water can significantly reduce your chances of irreparable water damage. Or of permanently sending your camera to Davy Jones locker. 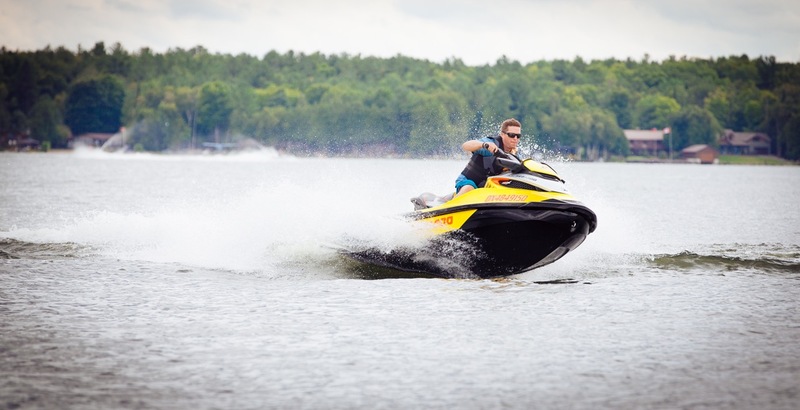 Check out my favourite Sea-Doo rides! If you enjoyed this post, check out my other riding tips.